Easy simple recipes that are all about the flavour. As a mother of 3 small kids, most of my recipes are child friendly showcasing a wide range from different global cuisines. Pumpkin is an amazingly sweet vegetable once cooked. The hardest part about this dish is probably peeling the skin. It doesn't take long to prepare and is a nice addition to the table. Even though this dish is Goan, it would go nicely with a roast dinner as well, just because it isn't spicy at all. You do not need to add any water while cooking as the pumpkin will naturally release it's own water and cook in its own steam. Remove the seeds from the centre of the pumpkin. Peel the pumpkin skin off with a sharp knife and cut into 1" cubes. Put a large cooking pot on the heat. Add some oil. If you have coconut oil, it would lend a better taste to the dish. Fry the onions in the oil till translucent. Add the dry red chilly and some salt to taste. Add in the pumpkin pieces and cover and cook till almost done. Lastly add in the dessicated coconut. You could use fresh coconut as well, but I always have dessicated coconut on hand in my pantry so it's a quicker alternative if you don't have the fresh one. Once you've added the coconut, cook for another 5 mins so that the coconut absorbs all the flavours of the pumpkin and then serve. If you do like to have this dish more spicier, then add a few more red chillies. Overall it should be a mild sweetish dish with a hint of chilly coming out in the background. Momos is the Nepali version of the Chinese dim sum. The Nepalese make their momo filling slightly differently to the Chinese, using a bit of butter in the filling, along with some turmeric powder cooked in butter or ghee. The rest of the ingredients are more or less the same. 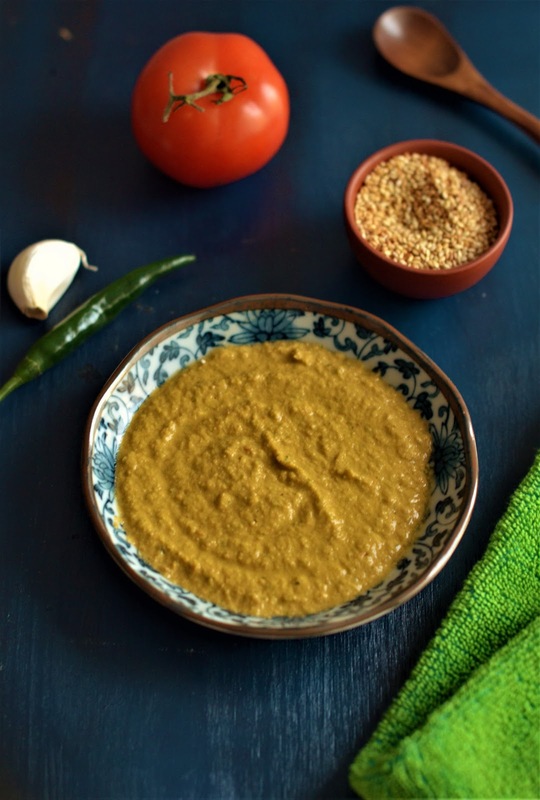 This sesame seed chutney is one of the typical chutneys served in Nepal along with their momos. 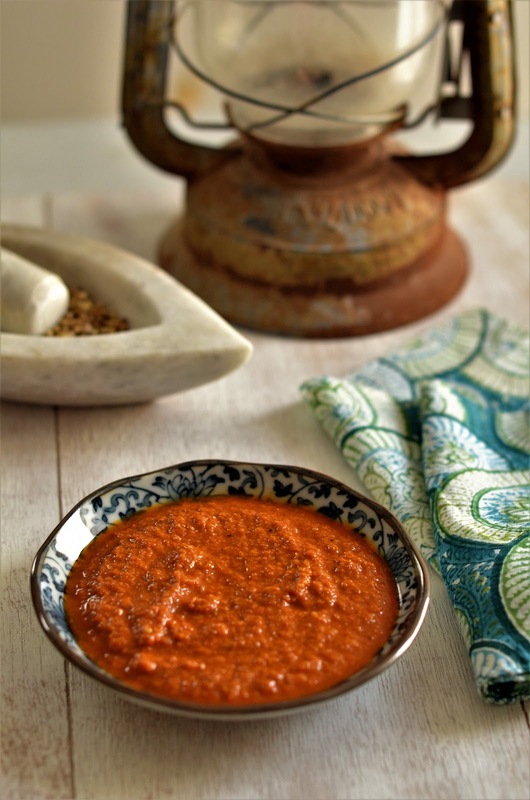 I fell in love with its unique taste and it's one of those chutneys that can easily be used elsewhere as a dip too, maybe for some carrot sticks or as a dip for kebabs etc. It's roasted nutty flavour will have you hooked once you taste it too. I have used a green chilly in this recipe as the only dry red chillies I have are the Kashmiri ones, which are known for their colour not spice. I wouldn't recommend using the Kashmiri one as it will alter the colour of the chutney. The Nepalese however use a spicier dried red chilly instead. You can completely omit the chilly if you want this chutney to be child friendly. The chutney tastes best, served cold with the hot momos. So keep it in the fridge once made. Roast the sesame seeds on a pan on low heat till they turn a nice golden brown colour and they give off that lovely nutty smell. Reserve and keep. In a mixer, add in the sesame seeds, garlic, coriander leaves and green chilly. Grind to a paste. Then add in the tomato and grind again. Add the water last. This paste is not too thick or too watery either. Somewhere in between. 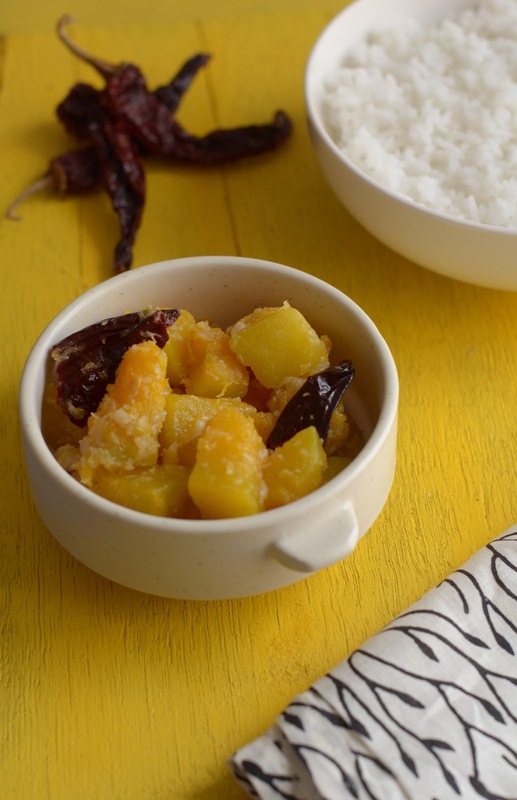 This chutney can easily be stored for a few days in the fridge. Served best cold. Try it out! I'm already thinking of multiple ways in which I can use this amazing chutney! This famous Indian dessert is made by cooking grated carrots in milk and reducing that mixture down till all that's left is the grated carrots. This is not one for those who are calorie counting, as it's cooked with ghee and sugar too. You can also do a cheat's version of this dessert, by using condensed milk to shorten the cooking time. In this case, I would suggest you use just a little milk, say half a cup or about to cook the carrots before adding the condensed milk. I have tried to make a slightlier healthy version of this dish (if that's even possible with carrot halwa! ), by using lesser sugar and a lot less ghee. Makes me feel a little less guilty later on! A note to keep in mind is to make sure the carrots are cooked properly. You do not want that raw taste of the carrots coming through. Cook it the first time with the milk and the slow frying at the end should finish it off nicely. First grate the carrots after peeling off the skin. Put a big non stick pan on the heat. Put 5 tsps of ghee in the pan. Fry the grated carrots till softened. Then add in the milk, sugar and the cardamom powder. Keep the heat on a medium, making sure you are constantly stirring the mixture so that it doesn't burn. Keep stirring till the milk is almost evaporated. For a richer flavour, fry the cashews and raisins separately in a tsp of ghee before hand and then add that to the carrot halwa. 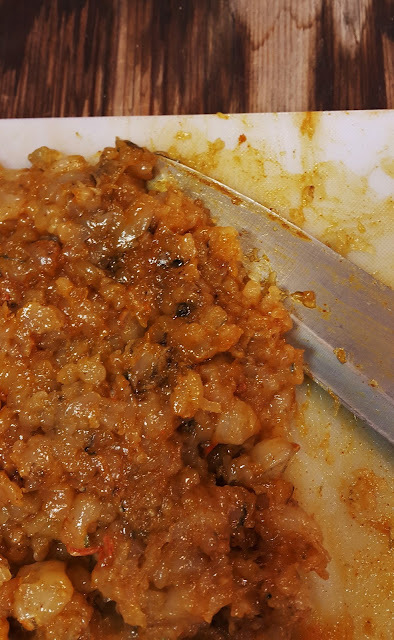 Once you've added the raisins and cashews, fry the mixture slowly on a low heat, taste for sugar (I have used a little less in this recipe) and once the oil starts releasing from the carrots you know that the carrot halwa is ready. It tastes best served warm with cold ice cream. This was one recipe that was handed to me just by word of mouth. I had heard so much about it, but somehow my mom never made it at home. This was made back in the good old days in my grandfather's time. My grand Aunt used to make this chutney. Mom remembered having it and how it was made, but unfortunately didn't have any exact measurements to give me. She remembered that it was a cooked chutney, very unlike the green version. They used to carry it with them on their train holidays up north so maybe it was cooked so as to last for a longer period of time. This is my version, going based on what she told me, with a few adjustments of my own. In a mixer, grind the red chillies, the ginger, garlic, cumin and coriander seeds, adding a bit of water as needed to get a fine paste. Add in the sugar, salt, turmeric powder and tamarind paste. Make sure the first paste is nice and thin and smooth before you add the coconut. Add the grated coconut next. Grind the coconut paste till you get a beautiful red thick paste. Check for seasoning. In a small pan, add a tablespoon of coconut oil. Put the heat on medium low. When the oil is warm, add in the coconut paste and slowly add a little water at a time, till you achieve a thick gravy like consistency. Cook it for about 5 minutes and your chutney is ready to serve. 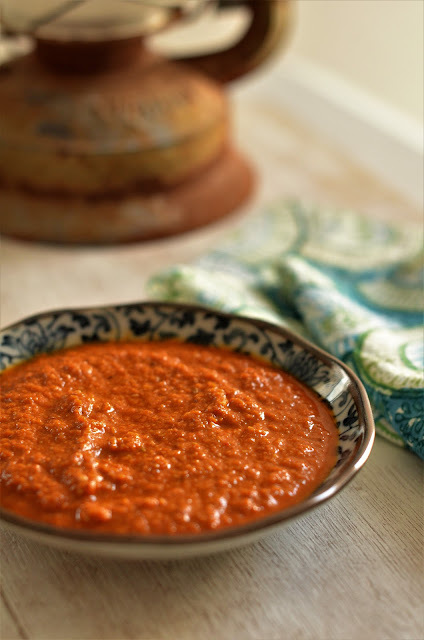 Cooking this chutney matures its flavour and complexity giving it a wonderful taste. Store in the fridge in a glass container. Ginger garlic paste is the base ingredient for almost any Indian food. Whether you are making a curry or a vegetable, it always comes in handy. And there's nothing better than the homemade stuff right? The more involved I seem to get with food and cooking, the more I value the whole concept of trying to make as much as possible at home without having to buy store bought products. In today's world, where we are never really sure what goes into anything we eat, its best to try and make as much as you can at home. I know most of us are really short on time, so make larger quantities that can stay for a while, instead of small bottles where you find yourself having to make a new fresh batch every week. The basic principal of this recipe is to use equal quantities of ginger and garlic. Some recipes call for water, but I don't see the need for it, as water will naturally come out from the ginger and garlic. I recommend grinding the ginger first, and pre cutting it in smaller pieces before you throw it into the mixer. 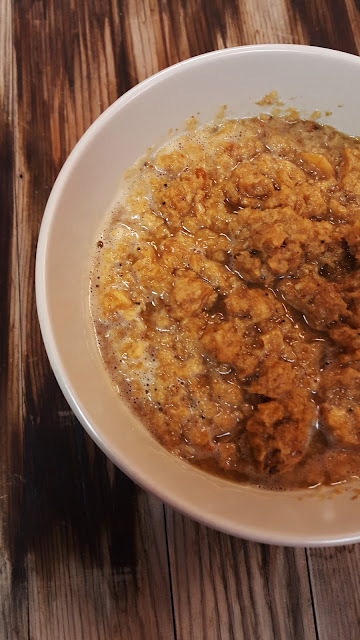 If you are dealing with larger quantities like I did in this recipe, I grind the ginger first and remove, and then grind the garlic, just to make sure there are no chunks of either in the paste. Turmeric is a natural preserving agent. So add a little to help keep it for longer. For my quantity I found that 1/4 tsp was more than enough. You want a very slight yellow tinge to your ginger garlic paste. Don't over do the turmeric. The way I looked at it, is, you don't want it to change the colour of a dish that you might be preparing later, so keeping that in mind too, just add a little. Oil is also a natural preserving agent. You can't go wrong here in how much you add.. For this quantity I've added 5 tbsps but if you are making lesser, then 2 to 3 tbsps should suffice. Salt is another preserving agent. Again, don't add too much as you do not want it affecting the dish you use it for later. I DON'T add vinegar to my paste when making it. It will slowly turn the whole paste an alien bright green and unless to want to show your kids a bit of cooking magic or some science fun, I wouldn't recommend adding any vinegar at all. Always store your ginger garlic paste once made in the fridge. You can store it in a glass bottle, and it will sit nicely in the door of your fridge for as long as you want. Make sure you use a clean spoon when taking it out, and that the spoon doesn't come into contact with any other food item to avoid contamination. This recipe makes for 2 mayonnaise sized - 750ml bottles of paste. If you would prefer to make less, just use half the quantity of all the ingredients. Peel the ginger and garlic. The best way to peel ginger is to use a teaspoon. It helps to get into all those nooks and crannies of the ginger root. But if you want somthing faster, then use a sharp knife to slice away the skin. I find the later way, always creates a bit of wastage that I like to avoid. Garlic is best peeled by twisting the skin in an anti clock wise motion to remove the skin. Another alternative is to give is a small bash with the palm of your hand to release the skin. Cut the ginger into smaller pieces and set aside. Grind the ginger in the mixer to a fine paste. Remove in a bowl and set aside. Add the garlic next, into the mixer. Grind to a fine paste. Now add the ground ginger back in, and add the rest of the ingredients. ie. the salt, turmeric and oil. Blend till smooth. Store in a glass air tight bottle in the refrigerator. Tongue is now quite easily available in supermarkets and is one of our favourite sandwich fillers for the next day's lunchbox. I usually make a spicy version that my hubby loves, but the kids don't like it as the spice is a bit more than they are generally used to. So I decided to try making it the classic way with just onions and a few whole spices. The traditional method is made by using saltpeter. But since it's not available where I live, I just used regular salt instead. The kids loved it and it was gone before I could say boo! There are many ways to remove the skin off the tongue which you must, as its very tough and can't be eaten. Some involve boiling it for a little while in hot water and then pulling it out. I just prefer to slice it off with a really sharp knife. Nowadays if you tip your butcher a little, he will do it for you. You can adapt this recipe and use it to make it a beef roast instead, if for some reason you are not comfortable eating ox tongue. Slice the onions and set aside. The more onions you use, the more gravy sauce you will get later for the tongue. In a pressure cooker, heat some oil. Add in the peppercorns, cloves, cinnamon and dried red chillies. Then add the onions and cook till transluscent. Add in the tongue. Fry it for a few minutes and then add your water. Cover the pressure cooker and cook on full heat. When it whistles, lower and time for 45 minutes. Once 45 minutes are over, put the heat off, and remove the steam by lifting off the whistle with a fork. Open the lid once the steam has gone and put the pressure cooker back on the heat to dry up all the liquid. Dry up all the remaining liquid (leaving the tongue inside the pressure cooker) till you get a very thick sauce from the onions. Once cooled, remove the whole spices (discard), and slice the tongue as finely as you can. Take a really nice sharp knife to do this. Store in a glass airtight food container and drizzle the sauce over it. You could alternatively store the sauce separately, so you can add it when you so wish. To be honest, for the kids, I omitted the sauce and just gave them the tongue. My hubby loved the sauce on his sandwich. Most Goan vegetable dishes are usually made with coconut. You could use fresh coconut, but for those who don't have it readily available, dessicated coconut will do just fine. The classic way to cut this vegetable is in long juliennes. It's a simple, easy dish to make, that is also very mild and a great accompaniment to any curry and rice. When buying the tendli vegetable at the supermarket, make sure you don't buy the very fat ones. A nice medium slender size is what you should be aiming for. Top and tail the tendli vegetable. Simply put, it means removing the two end bits of the vegetable. Cut in slivers or juliennes and set aside. In a casserole, heat oil. When hot, add the onions and green chillies. Saute till the onions turn a nice golden brown. Add the salt or stock cube if you prefer, turmeric powder, and the sliced tendli vegetable. Saute for a few minutes and then add the dessicated coconut. Cover and cook on low till the vegetable softens. Make sure you keep stirring and checking once in a while to make sure it doesn't burn at the bottom. If you find it getting too dry, add a splash of water to create a nice steam for the vegetable to cook. In about 10 - 15 mins, open and check for softness and taste. Adjust the seasoning if needed and serve. This is a super simple recipe that gives you a healthier version of maple syrup. There is absolutely no sugar in this recipe. Just pure syrup with all its goodness. This syrup will go nicely on top of a stash of pancakes, or drizzled over any cake, or crepes. You can even have it the Srilankan way,(they have something similar) where they drizzle molasses over a bowl of yoghurt and serve it as dessert! This versatile syrup can also be used to marinate steaks or as a drizzling sauce over some meatballs. Mix in a bit or siracha and you have a lovely dipping sauce for kebabs as well. In a deep pan, add the water to the dates and let it cook for about half an hour. Once softened, remove and strain the mixture through a muslin cloth. This is the only part of the recipe that requires a bit of muscle to squeeze out all that goodness. The syrup at this point looks more like date water. Squeeze as much as you can from the muslin cloth and discard the rest. Put the syrup back on the heat, adding 2 cups of orange juice. Now you can do this next step the quick or slow way. If you happen to be around the kitchen with a bit of time on your hands, keep the heat low and slowly reduce the liquid. If time isn't on your hands, you can turn the heat higher, but do stay around so you can watch the pan and it doesn't boil over. Reduce the liquid to about half of the level you first started with, then add the juice of 1 lemon. Keep reducing it, till you notice the syrup starts to get a slightly thick. If you notice any froth or scum, remove it with a spoon, as this is cloud up your syrup and you won't get a nice clear end result. The final syrup consistency should be about the same as regular maple syrup. Unlike jam, this wont thicken much once cooled, so stop when you are satisfied with how thick you want your syrup to be. You just have to trust me on this.. This thick green goodness is nothing short of finger licking good. Serve this as a filling on a buttered bread sandwich or as a dip for kebabs, or just on the side as a chutney. A slight variation from most of the other recipes that call for coconut. This doesn't have any coconut in it! Even without the coconut, the consistency is still nice and thick, so for those of you who don't like coconut or can't get access to it, this is a wonderful alternative. Also the fact that there's no coconut in it, gives it a longer shelf life. It will store easily in the fridge for a couple of weeks. I've added a wedge of lemon, with it's skin and all. Just removing the seeds. Lemons are so good for you and full of lots of nutrients. This is probably the first time, my method is just a couple of lines! It's that easy! So go ahead and try it.. I promise you, its awesome! Cut some of the bigger ingredients into small pieces (ginger, green chillies, lemon etc) and blend all the ingredients together in a mixer, till you get a nice thick paste. Bottle and refrigerate. This is a favourite dish from my village in Goa, one of those finger licking dishes that taste best eaten by hand. 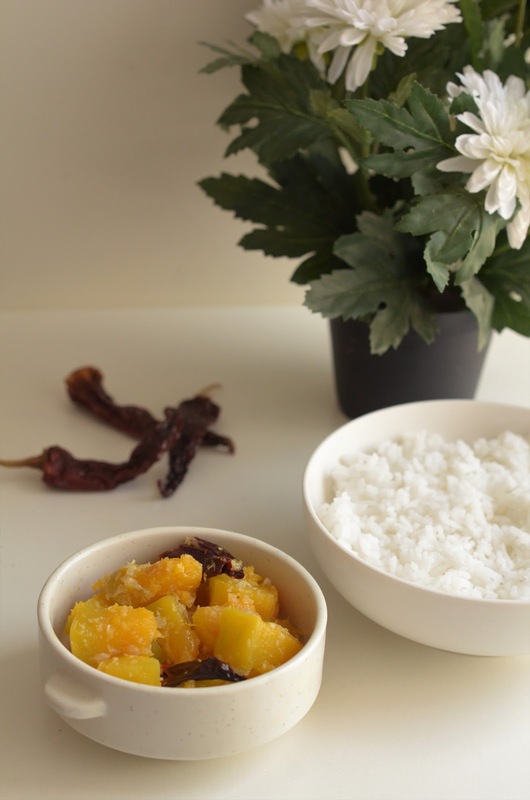 This simple dish is best had with white rice. You can add ladyfingers (okra) or green mango as a variation to this basic recipe. Both lend their unique taste to the dish, taking it to another dimension. If you eat this curry the next day, the spices get more time to mature, giving the dish some more depth of flavour. This coconut prawn curry is best made in the local earthen pots, and nothing tastes better, than having the remaining bits and bobs of the curry that's stuck to the pot, scooped up with a little rice! Heaven in every bite! Marinate the prawns with salt, turmeric and chilli powder. Cling wrap and set aside for an hour. In a mixer, grind the kashmiri chillies. When reduced to a powder, add in the onions and grind to a fine paste. Then add in the tomatoes, ginger garlic paste and spices such as cumin powder, coriander powder, turmeric powder and chilli powder. (note: you can use cumin seeds and coriander seeds instead of the powder version). 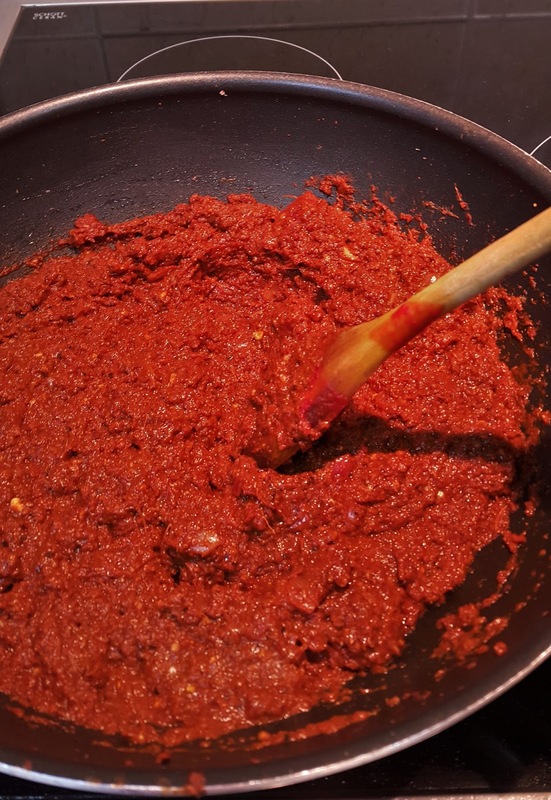 You should get a really nice thick red masala paste. Heat oil in a casserole. Add in the roughly chopped green chillies and also the masala paste. Add the kokum and cook for about 5 mins. Add in the tamarind paste and give it another 5 mins. Reconstitute the coconut milk powder by adding 2 cups of water. Add the water slowly to the powder, so you can remove any lumps that form. I prefer to use lukewarm water. Keep the heat on a medium and let the coconut milk cook a further 10 mins, taking care not to let the curry boil or it could cause the coconut to split. Once the curry is ready, add in the marinated prawns and cook for no more than 7 mins. Note: for any fish/prawns that are added to a curry, do not cook for more than 7 mins for that perfect texture. Fish cakes or cutlets as they are commonly known are extremely versatile. They can be served as a snack, in a sandwich, as an appetizer or a side for a party, and they make a good healthy addition to any kid's lunchbox. All kids love to eat these homemade little patties and you will find yourself struggling to stop them from having more than one at a time! I do have to tell you a funny little story about these patties.. My mom, I think makes the best kind. She can turn anything into a patty, vegetables, meat, chicken, lentils... I know I'm biased, but I've tasted a lot in my lifetime from all different sources, and I don't know anyone else's who matches up to hers in terms of flavour. But aside from that, the funny bit I remember when she used to make them, was, she would always count the number of patties she made. She usually made a lot and kept, as it was the easiest snack to go to in the fridge whenever we felt hungry. Fyi, these taste great even cold! For some reason, she didn't like the idea of making 13 patties. So if she did land up making that many, which happened quite often, she would go through the whole process of readjusting the sizes of all the others, to make sure there were either 12 or 14! Funnily, I found myself counting them when I made it yesterday and felt a bit of relief knowing there were 16! In my mom's version once the fish is cooked and mashed, she adds in the raw onions, chilles etc to the mix to bind it. In this recipe, I have cooked the onion mixture. My mom's recipe is great if you want a bit of texture to your cutlet, but I had my kids in mind when I made this and you know kids, they don't usually like crunchy bits and bobs in the middle of their food! The whole process can take a bit of time, but the good thing about it, is you can stop at any stage, put them in the fridge and then take over again when you need to. I've used shark fillets, as the meat is nice and chunky and barely has any bones so you never have to worry about that accidental bone. In a casserole dish, add the washed shark fillet pieces along with the water, salt and turmeric powder. The water level should be enough to surround each piece of fish. Bring it to a boil, and then check the fish. You may need to turn some of the pieces around so they get immersed in the water, and cook. Once the fish looks tender, which should take around 5 minutes, remove the fish pieces in a plate. Reserve the water, you may need it later. In a small pan, fry your onions, green chillies, ginger garlic paste and spice powders till the spice powders and onions are cooked. Do this on a low to medium heat so as not to burn the mixture. Put the heat off and reserve. Using a fork, mash up roughly the cooked fish pieces. Add in the cooked and cooled onion spice mixture and the chopped coriander leaves. Add in the hot and sweet sauce. This step is optional, but I do find it gives it a lovely burst of flavour. If you can't find it, you can replace it with a sweet chilly sauce. Don't forget to taste it now. Remember, all the ingredients are cooked so there's no worry there. Adjust your salt or anything else you may want to add. Form them into patties. The traditional method of making these patties is a long oval shape, to indicate they are fish and not beef. Check and see how the patties come together. If you find the mixture too dry, add a tablespoon of the reserved fish water from before to help give it that moisture and bind it. Once you have formed the patties, you can store them in the fridge for about 15 minutes so they firm up and are easier to coat. You will have less chances of breakage if you do this step. Make sure you have the next two steps ready. Beat an egg in a shallow bowl, wide enough to dip the entire patty. Always always season your egg with a little salt and pepper. Every little bit of seasoning helps in the final taste. Keep another plate with breadcrumbs ready. Remove the patties from the fridge, coat them first in the egg, then the breadcrumbs, adjusting the shape as you go along. My advice would be, to coat all of them and reserve. Don't try to coat and fry them at the same time. You can easily burn your cutlets this way. Coat them all, then you can use your full attention for the frying stage. Once coated and crumbed, you can again reserve them in the fridge, if you would like to fry them fresh, say, for guests in the evening. Or you can fry them straight away. Heat the oil in a pan. Add the coated fish cutlets. As you add them to the pan, you can again check for that final shape. My mom's weapon of choice (as I like to call it) is a spatula and a fork, to help flip the patties in the gentlest way possible. Here, next is my most crucial tip when making patties. If your ingredients are cooked, you must fry your patties on a fairly high heat. Doing so on a low heat can cause them to break. If you make patties where the meat is raw, then the fire needs to be lower, so that the meat can have time to cook! Stay right near the fire, turning the patties as gently as you can, ever so often, so that they get a nice golden colour. Remove and set aside on a plate. Store in the fridge once cooled. These can easily stay for a week in the fridge, if you can stop everyone from digging in quietly. Do remember, any time you open the container, to wipe off any moisture you see collected on the lid or sides, as these will soften the cutlets and make them wet. Plantain bananas cooked with dessicated coconut and curry leaves. A Goan speciality. Great way of having plantains the savoury way. These are the very long yellow bananas that you see in the supermarket. The best time to use them for this vegetable is when they are ripe but still firm. They will soften as you cook them. This vegetable has a sweetish taste to it that takes you back to the beach! Put a little regular oil in a pan and add the coconut oil as well.. I wanted the coconut oil more as a flavouring so I added just a little. Add the mustard seeds and broken red chillies and curry leaves. Add the spice powders and salt into the oil so that the mixture coats the bananas nicely later but be careful not to burn the spices on too high a heat.. add the bananas and give it a quick toss on high heat.. add in the dessicated coconut and give it another couple of minutes till the bananas soften and remove.. Tip: Adding the coconut oil gives this dish a nice oomph and enriches it's flavour so it's a definite must add..
Prawn Balchao is the ultimate Goan Pickle! A must have in every Goan house, this delicacy is nothing short of finger licking good! Prawn balchao, being spicy, goes extremely well with a simple fish curry and rice or a dal and rice, but tastes just as good spread on top of a buttered toast! For the best flavour, and believe me, this is hard to do, you need to let it sit for a couple of weeks to marinate and let the flavours bloom. I've used a mix of dried and fresh prawns here, so there is a nice combination of textures and flavours. This recipe makes for 2 large bottles and 2 jam bottles worth of balchao! Wash the dried prawns to remove any sand or dirt impurities then soak in a 1 1/2 cup of vinegar overnight. The next morning, wash and devein the fresh prawns. Marinate with 4 tsps of salt and 1 tsp of turmeric powder and 1 tsp of chilli powder and reserve for an hour. After an hour, finely mince the prawns. I just used a really sharp knife to do this. Add the dried prawns that have been soaking in vinegar in the mixer. There should be almost no vinegar left, as it will be absorbed almost completely by the prawns. Remove the prawns carefully, and add to the mixer. Then add the remaining vinegar, leaving back the last teaspoon or so to discard. That way, any impurities or sand or dirt that was still around, should have settled to the bottom and can be discarded. Once you've added the dried prawns to the mixer, blitz it for a few seconds, till the mixture is ground but still coarse. I like to leave a little texture in my balchao. Remove and reserve. Peel the ginger and garlic and blend in the mixer, adding a little vinegar from the bottle if you need to losen it up. Remove and reserve. Dry roast the 25 kashmiri chillies in a pan till they warm up and you can smell the aroma. Put the heat off and let it cool, then grind it in the mixer, along with the 1 tsp of cumin seeds, 1 (2" piece) of a cinnamon stick, 6 tsps of kashmiri chilli powder and 1 tsp of cloves, to a fine powder. Add in the rest of the vinegar from the bottle and the ginger garlic paste you made earlier, to get a nice smooth paste. Peel 3 onions, roughly chop and add to the mixer. Give it a quick blitz, to get it chopped but not pasty in consistency. (you could also chop it finely by hand - this just saved me on some extra work by putting it in the mixer). Remove. In a deep pan, which you plan to make the balchao in, heat 1/4 cup of oil. Fry the onion mixture till its nice and golden. Add the tomato paste and cook nicely on a low to medium heat, taking care not to let it burn. Add the spice paste mixture and the rest of the oil (1/2 cup of oil) and let it cook for a further 10 mins. Once done, add 2 tsp of sugar to balance out the flavours. Add the dried prawns and the fresh prawns and cook on low for half and hour or so till the mixture has dried nicely and you can see the oil starting to separate. Cool and bottle in a glass bottle. I got 2 large bottles and 2 jam bottles completely full! You can leave the bottles out for a day before putting it in the fridge if the weather is not too hot. Reserve for at least 2 weeks before eating.. This last line is probably the hardest part of the recipe! This is my short cut easy version of the famous Goan Caldin Fish Curry. It's a very versatile curry that can be adapted to make it a vegetable, chicken or an egg curry. No grinding involved here. The process is simple and quick to make in a hurry. Goes extremely well with kids who love its mild flavour. You can always bump up the spice by adding more green chillies or more chilli powder. But I love this mild curry for its simplicity. Cut the fish into medium sized cubes. Season with salt and an additional 1/4 tsp each of turmeric powder and chilly powder. Reserve while you work on your curry. In a casserole, heat oil. Use coconut oil for maxium flavour. Add your chopped onions and kokum. Add the whole slit green chillies and all the spice powders.. ie. turmeric, coriander, cumin, curry and kashmiri chilli powder. Fry on a gentle heat so as not to burn the spices. Add a dash of water if you feel its getting too dry. Once nicely sauteed, add your reconstitued coconut milk. Season with salt. Remember to add a little less salt than usual as you have already added salt to the fish when marinating. Let the mixture simmer on a low heat. Boiling the coconut milk can cause it to split. In about 10 mins the curry shoul d be cooked. Drop the fish cubes inside. Fish in curries should never be kept for longer than 7 mins to keep its texture. Time your fish. Once the 7 mins are over, check again for seasoning and serve hot with steaming white rice. Tip: There are a lot of varieties you can experiment with for souring this dish. I've used kokum, but you can also use green mango or tamarind paste or extract. Tip: This dish is typically made with the Indian silver pomfret which brings out the best flavour of this dish.